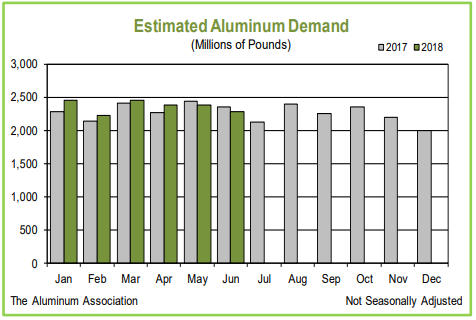 According to the preliminary estimates from Aluminum Association, aluminium demand in the United States and Canada (shipments by domestic producers plus imports) stood at an estimated 6.4 million tonnes through June 2018, up 2.0 per cent over the same period of 2017. Demand for semi-finished products totalled 4.6 million tonnes, up 2.6 per cent from YTD 2017. Apparent consumption (demand less exports) in domestic markets totalled an estimated 5.6 million tonnes, slightly up year-over-year. Aluminum net shipments (including exports) by domestic U.S. and Canadian facilities totalled an estimated 858,196 tonnes during July, an increase of 5.8 per cent over the July 2017 total of 811,023 tonnes. Shipments of aluminium mill products rose 4.2 per cent over the previous year to 622,328 tonnes. Shipments of aluminium ingot for castings, exports and destructive uses advanced 10.3 per cent YoY, totalling 235,414 tonnes. Through the first seven months of the year, preliminary producer shipments totalled an estimated 6.4 million tonnes, an increase of 1.7 per cent over YTD 2017. July inventory levels totalled an estimated 1.5 million tonnes, up 2.9 per cent over the previous month and 12.6 per cent YoY. The demand is driven significantly by the growing GDP in the U.S. U.S. real gross domestic product increased at an annual rate of 4.2 per cent in the second quarter of 2018 according to the "second" estimate released by the Bureau of Economic Analysis. In the first quarter, real GDP increased 2.2 per cent. Statistics Canada reports that real GDP in Canada was essentially unchanged in June, following a minor gain in May.